The C.A.P. 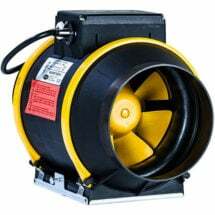 Day/ Night Variable Fan Speed Controller (VSC-DNe) is designed to gradually increase or decrease the speed of centrifugal fans depending on the day or night temperature set-points. 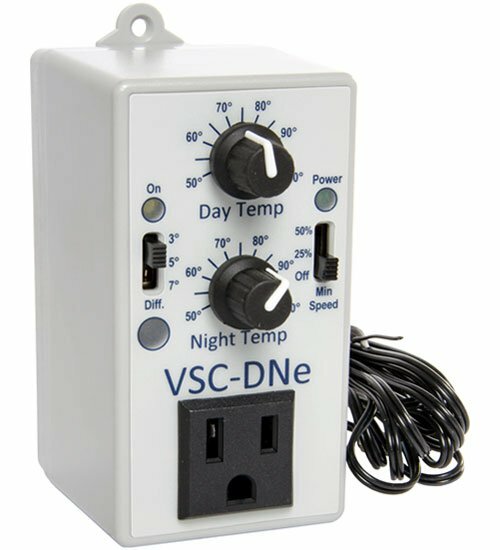 The VSC-DNe — now backed by Hydrofarm — enables you to determine precise temperature levels to achieve within your growing environment by way of proper ventilation. 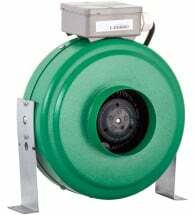 The temperature differential switch can be set at 3°, 5° or 7°F and comes complete with a 12 ft. probe. The day and night temperature knobs can be set between 50°F and 100°F independently. 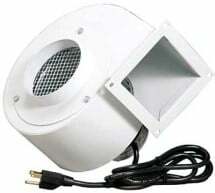 The built in photocell will automatically sense day or night and adjust the speed of your fan accordingly. Rated for 6 amps @ 120 volt. Includes a 3-year manufacturer’s no hassle warranty. 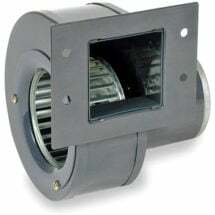 Includes a built-in outflow flange that can be securely mounted to a wall or ceiling. Quiet and built to last! Use for exhausting and ventilating stale indoor garden air. It looks like a jet engine yet pulls more air than you ever dreamed possible. If you’re after performance with a value price — it doesn’t get any better than this!